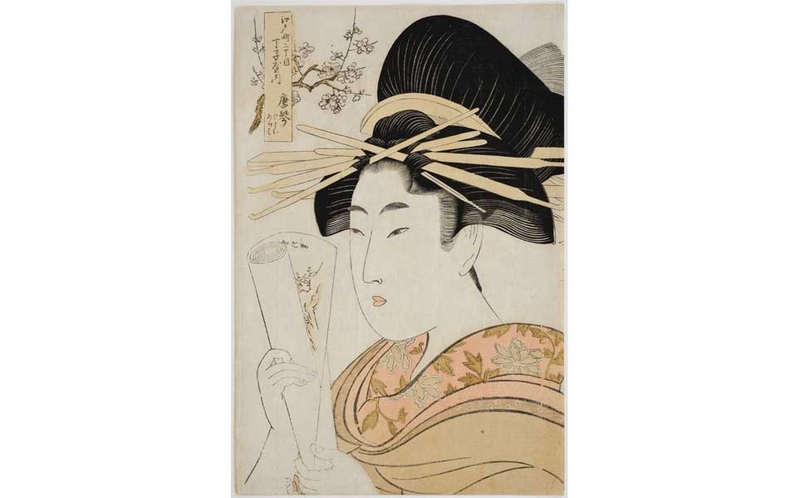 The Honolulu Museum of Art has one of the world's leading collections of Japanese woodblock prints, distinguished not only by its size, but also by its exceptional quality. While the museum is sometimes better known for later woodblock prints depicting landscapes by such artists as Hokusai (1760-1849) and Hiroshige (1797-1858), with the world's largest collection of art by Hiroshige in its holdings, it is equally distinguished by rare impressions by virtually every major artist involved in the first flowering of ukiyo-e, or the "art of the floating world," during the 18th century. More than any other time, this century saw the transformation of ukiyo-e from its early beginnings in vigorous, starkly beautiful monochromatic depictions of monumentally posed beauties such as those produced by the artists of the Kaigetsudō School; through various experiments with hand-coloring and increasingly elaborate compositions nowhere better revealed than in the towering figure of Okumura Masanobu (1686-1764); to the remarkable technical innovations of full-color or "brocade" printing by Suzuki Harunobu (1725?-1770); and finally to the full maturation of ukiyo-e in the following generations, represented by some of Japan's most iconic designers, like Torii Kiyonaga (1752-1815) and Kitagawa Utamaro (1753-1806). The prevailing aesthetic of ukiyo-e in the 18th century was that of idealized beauty, explored in all of its multitudinous manifestations. 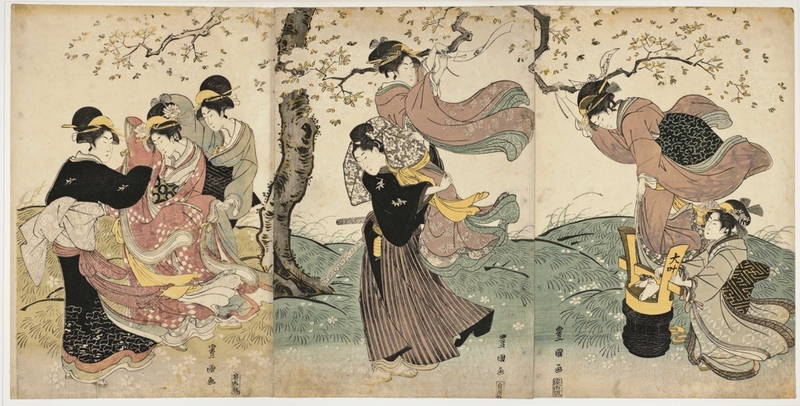 While the courtesans of the pleasure quarters became "the universal symbol of ukiyo-e," artists found equal inspiration in women of other social classes, and, typifying the social developments of their age, they expanded their work far beyond the traditional limitations of elite patronage, seeking beauty in the tea houses, inns, shops and even the streets of everyday life, and in the case of Utamaro, discovering it as profoundly in a family moment between a mother and child, or an elder and younger sister, as in the sumptuous robes and elaborate hairstyles of a courtesan parading in full splendor through the Yoshiwara. 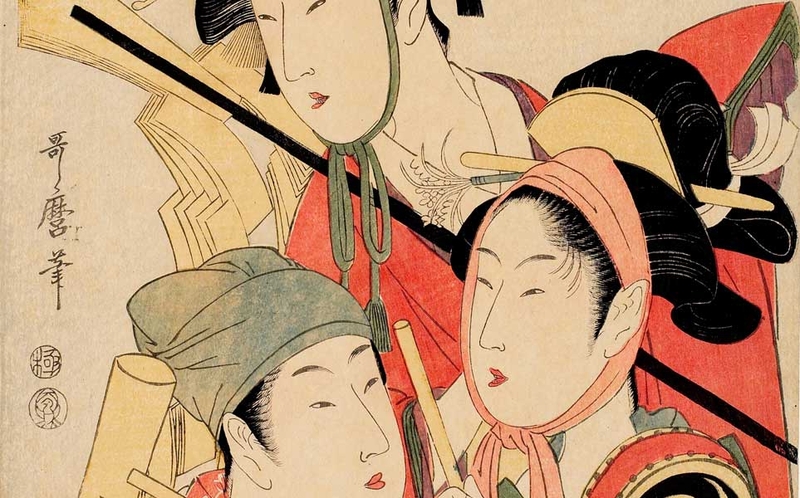 Allure traces the conceptualization of beauty over the course of the 18th century from Kaigetsudō Dohan's Courtesan of around 1710 to the intimate portraits of Utamaro at the end of the century. This exhibition is based on the traveling exhibition The Beauty of the Moment: Women in Japanese Woodblock Prints, held at the Rietberg Museum in Zürich, Switzerland, in 2012, and marks the homecoming of many internationally renowned prints from the Honolulu Museum of Art's collection. It is a rare opportunity to see these works by some of Japan's most beloved artists, after which they will return to the museum's vaults to rest for several years before they will again be available for public display.